Greetings again from the darkness. There is a lot going on in this latest from writer/director Ira Sachs, and every bit of it provides some commentary on the basic everyday life struggles faced by normal folks. There is also a continuation of the ongoing NYC vs Brooklyn “friendly competition”, as well a reminder of the downside of gentrification. Mr. Sachs and his frequent collaborator and co-writer Mauricio Zacharias kick off the story with Greg Kinnear’s Brian awkwardly exchanging greetings with Paulina Garcia’ s (so terrific in Gloria, 2013) Leonor while the son’s of these two share an equally awkward meeting. Leonor is the long-time tenant in the dress shop located below the apartment where Brian’s recently deceased father resided. Jake (Theo Tapitz) is an aspiring artist who doesn’t easily make friends. Tony (Michael Barbieri) is a brash, fast-talking kid who is a bit more street wise and outgoing. The two boys quickly bond … while at the same time, the parents begin a quiet battle. Brian’s sister (played by Talia Balsam) demands her fair share of their father’s estate through higher rent on Leonor’s dress shop. It turns out their dad never raised the rent despite the number of years and the developing neighborhood. Kinnear’s wife Kathy (the underrated Jennifer Ehle) tries to play peace-keeping negotiator so that the boys’ friendship is not affected. As is often the case, the kids handle the situation better than the adults. The film’s best scenes feature the two young boys … a blossoming childhood friendship that is all too rare on the big screen. If the boys weren’t so severely impacted, the adult interactions could almost be white noise. Themes of money vs love, greed vs emotion, as well as recurring and various instances of rejection, all play a part in this multi-faceted story. Examples of rejection include a girl rejecting a boy, Brian’s rejection as an actor, and the multiple rejections in the negotiations for the shop. Mr. Sachs has a real knack for putting real people in real situations that result in difficult decisions. 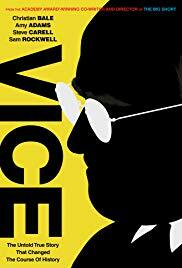 All of the acting is top notch, including Alfred Molina in a small role as Leonor’s attorney and advisor. But it’s the boys – Tapitz and especially Barbieri – that elevate the film. Watching the boys grow closer despite the all-too-close conflicts reminds a bit of the friendships in Rob Reiner’s classic Stand By Me. Young Mr. Tapitz already has a few short films under his belt as a director, and Mr. Barbieri is certain to get many more opportunities to flash his on screen talent. Greetings again from the darkness. Why, Billy Ray, why? 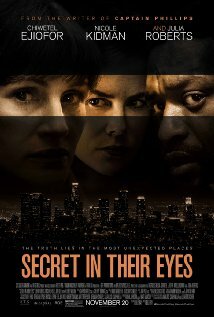 It’s not surprising that Hollywood green-lighted the Americanization of the 2010 Oscar winner for Best Foreign Language film, El secreto de sus ojos. That original from Argentina is exemplary filmmaking and a thoroughly entertaining and compelling mystery-thriller; a must-see for any true film lover. Even if an Oscar-studded cast is hired (2 Oscar winners, 8 nominations), the guiding inspiration for a remake should be more than losing the subtitles and filming Julia Roberts without make-up. The story balances two timelines spanning 13 years. Jess (Ms. Roberts) is an investigator who works with FBI Agent Ray (Chiwetel Ejiofor), Assistant District Attorney Claire (Nicole Kidman), and a blustering District Attorney played by Alfred Molina. When Jess’ daughter is brutally murdered, the investigation is impacted by the suspect’s role as a department snitch. When we catch up all those years later, the unrequited attraction between now former FBI Agent Ray and now DA Claire is as strong as ever; Jess’ appearance is on par with someone suffering from a terminal illness, and the murder still hovers over these characters as if it had occurred last week. It’s a fascinating story that was handled superbly in the original, yet mostly comes across as uninspired in this latest project. At times, it’s even a bit confusing in how the two eras are handled. The score from Emilio Kauderer and a couple of fine scenes from Ms. Roberts (although she gets no credit here for appearing sans-makeup) are the best parts of this one. Otherwise, Mr. Ejiofor (usually a fine actor) goes over-the-top, while Ms. Kidman is simply miscast and unable to generate the proficiency required for her position. Other support work comes courtesy of Dean Norris (“Breaking Bad”), Michael Kelly (“House of Cards”) and Zoe Graham. Other than lacking the grit and realism of the original, the editing and camera work (so exceptional in the first version) at times come off as amateurish this time around. The soccer/futbol sequence from the original is replaced with Dodgers baseball (Chavez Ravine and Vin Scully) and a link to former Manager Walter Alston. Normally that would be considered an improvement, but again, these fall short and fail to generate the necessary suspense. A weak impersonation of the famous long-tracking shot certainly doesn’t help. For anyone who hasn’t seen writer/director Juan Jose Campanella’s (an Executive Producer here) excellent original, this version from Billy Ray (Shattered Glass) might prove interesting enough; however, those same folks are strongly encouraged to instead track down the original, and experience the emotional depth and filmmaking expertise that made it such a worthy Oscar winner. Greetings again from the darkness. 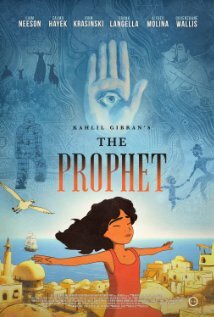 An animated, artistic, philosophical parable based on a 1923 book from a Lebanese poet … it’s as if the filmmakers went out of their way to make sure most everyone would be turned off by some aspect. Instead, director Roger Allers delivers a beautiful and thoughtful representation of nine of the 26 stories from Kahlil Gibran’s influential best-seller. The story revolves around Mustafa, an artist and poet who was exiled seven years earlier when his words were deemed harmful to the local regime. Mustafa is informed that he will be granted his freedom to return home, and as he is escorted through town, Mustafa periodically delivers his insightful and inspiring words to the people of the land. These make up the 9 segments (Freedom, Children, Marriage, Work, Love, etc) within the movie, and each of these segments is the unique work of a different renowned artist/director. The artistic style and presentation varies between each segment, and some employ the use of music (Damien Rice, Glen Hansard). As Mustafa recites the words of Gibran, the individual segments unfold with the artistry of each director. These blend well with the overall story which also features Mustafa’s housekeeper and her young daughter (who initially doesn’t speak). The voice acting is top notch thanks to Liam Neeson (Mustafa), Salma Hayek (the housekeeper), Quvenzhane Wallis (Almitra), John Krasinski (a lovesick guard), Alfred Molina (Sergeant), and Frank Langella (regime leader). Mr. Neeson is especially effective as the soothing voice of Gibran’s words. This was evidently a pet project of Salma Hayek, who also is Producer of the film. She wisely enlisted director Roger Allers, who has ties to Disney and the hugely popular The Lion King. The film is Disney-esque in its approach, but is certainly not aimed at kids. It’s really a blend of the segmented structure of Fantasia, the adult-themed style of Watership Down, and the philosophical meanderings of Gandhi. Gibran writes that “all work is noble”, and the work of these filmmakers certainly is. As with any poetry or philosophy, one must be receptive to the message and willing to be inspired. If not, it’s merely “love and flowers”. Greetings again from the darkness. 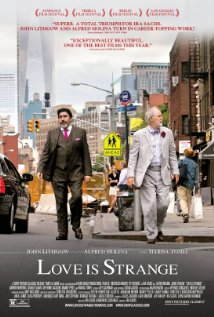 In a remarkable opening 6 to 8 minutes, we see John Lithgow and Alfred Molina prepare for, execute, and celebrate their official marriage after almost 40 years together. During this sequence, we quickly understand that Ben (Lithgow) is the emotional one, and George (Molina) is the pragmatic, balanced one. The brief ceremony is filled with love, admiration and happiness, and leaves us with no doubt that these two are dedicated to each other. Director Ira Sachs (Married Life, 2007) also co-wrote the script with Mauricio Zacharias, and the film excels while Lithgow and Molina are on screen together. It comes across as a contemporary version of the 1937 Leo McCarey film Make Way For Tomorrow (with Beulah Bondi) and highlights the obstacles faced by an elderly couple who face financial hardships, New York real estate misery, and the not-so-welcome generosity of friends and family. 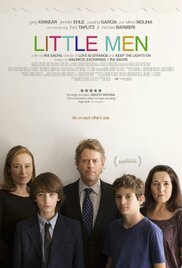 The gay component is not played up, rather the story is told in straight-forward manner as the couple is forced to live apart, and deals with loneliness and unease as they each feel out of place living in a party house with friends (Molina) and sharing a bunk bed with a typically awkward teenage boy played by Charlie Tahan. The boy’s parents are Marisa Tomei and Darren Burrows, who face their own marriage and parental issues. The happiness of the opening wedding ceremony quickly dissipates into real life misery for all characters. The only happy people are the grown men playing a Game of Thrones board game. Literally everyone else is unhappy, or at least disinterested. Although conflict is ever-present, the Catholic Church is the closest to a real villain. John Curran plays a Priest in the terrific scene in which Molina is fired (because of his wedding) from his Catholic School teaching job. The poor town of Poughkeepsie takes a couple of shots as well, but mostly it’s the pent-up frustrations of Tomei, the passive-aggressive approach of a few other characters, and the crazy teenage mood swings of Tahan’s character that keep Ben, George, and we as viewers quite uncomfortable. Instead, the joy comes from the subtle moments courtesy of the two leads. 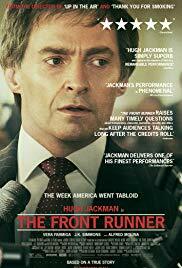 See this one for the performances of Lithgow and Molina, and for the beautiful Chopin piano throughout. Greetings again from the darkness. I just can’t believe it. Last year I was raving about Toy Story 3 being my favorite film of the year, and now here I am again extolling the excellence of another animated feature. However, Rango is a different experience … these are all new characters and a whole new look for animation. I would even say this is more a film for grown-ups than for kids, though kids will certainly get a kick out of Rango, a colorful chameleon energetically voiced by Johnny Depp. The story and film pay homage to many classic movies and especially to spaghetti westerns. You will easily spot the tributes to Star Wars, Apocalypse Now, Hunter S Thompson, Sergio Leone, Lee Van Cleef, Clint Eastwood, High Noon, and of course Chinatown. The main story line is nearly identical to Chinatown … the control of a town’s water. Here we get the Mayor, voiced by Ned Beatty, in the John Huston role. For film fans, this is just so much fun! Rango the chameleon is a very likable character who just wants to make friends. He dreams of being a hero so that people will look up to him. Of course, he learns the hard way what being a hero really means. The town of Dirt, the desert, and multitude of characters are all fantastically drawn. There are times the film has a look of live action with terrific lighting and detail, and the colors are perfect. The voice acting in the film is truly outstanding and it starts with Depp’s fine work. Also contributing are Ned Beatty (Mayor), Bill Nighy (Rattlesnake Jake), Isla Fisher, Abigail Breslin, Stephen Root, Alfred Molina (Armadillo), Ray Winstone, Charles Fleisher (from 1988’s Who Framed Roger Rabbit?) and Timothy Olyphant as the Clint Eastwood character no-named Spirit of the West. There is also a useful and very funny Mariachi band that pops up periodically to push the story along. Director Gore Verbinski is known best for his Pirates of the Caribbean movies (with Depp) and he really gets to go all out on his visual style here. He is helped immensely by George Lucas‘ Industrial Light & Magic (ILM) and their first foray into animation. Heads up Pixar … you definitely have some tough competition! A note of caution: I did notice a lot of younger kids seemed to get bored and had trouble following the story. There are some terrific action scenes, but there is also a great deal of time spent on the story and characters – not exactly perfect for keeping a kid’s attention.